Inspired by the 1960’s classic live-action TV series Batman! Individually numbered in the DC Comics Pin Mates™ series. Retro-styled, 2-inch scale wooden collectible features 360-degree details. 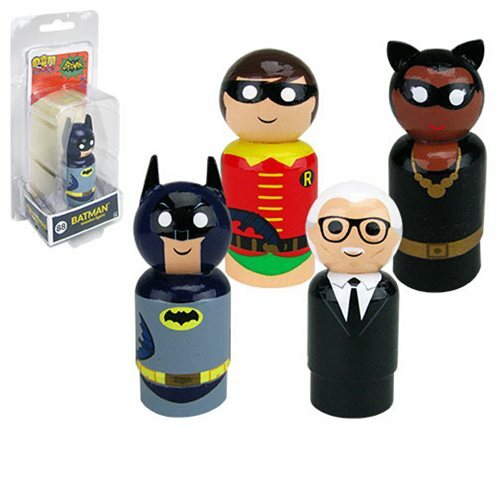 They're here: the Batman Classic TV Series Pin Mates Wooden Collectibles Set 2 from Bif Bang Pow! is ready for your collection! The adorable, 2-inch scaled wooden figures feature the CAPED CRUSADER™ with Batarang, BOY WONDER™ with Batarang, ALFRED PENNYWORTH™, and CATWOMAN™ from the 1960’s classic live-action TV series Batman. They add to the growing line as numbers 88-91 in the DC Comics Pin Mates™ series. All figures come individually packaged and feature detailed, brightly colored, 360-degree artwork. Ages 14 and up.